Bestselling author Cate Beauman is back with her 12th full length novel and her first stand-alone title: Secrets Hidden In the Glass. Her multi award-winning Bodyguards of L.A. County series has over 500,000 copies sold and a 4.4 rating with 8000+ reviews. Stained glass artist Callie Davis is in desperate need of a vacation. Burnt out and on the edge of a nervous breakdown, she’s fleeing the pressures of her career and is taking refuge on Massachusetts’ tiny Carter Island. Callie yearns for long, lazy days and pretty walks on the beach—blessed solitude and an escape from the complications of her life. Then she bumps into gorgeous Nate Carter and everything changes. Sheriff Nathan Carter couldn’t be happier now that the height of the summer season has finally come and gone. After four endless months, tourists have packed their bags and headed for the mainland. The quiet days of autumn are about to befall the town—the way Nate and his fellow Sandersonians like it best. But nothing ends up quite the way Nate expects when he meets the beautiful blonde with the big blue eyes. Callie’s pretty smiles hide secrets—deep, dark mysteries that could cost them both their lives if they continue digging into the past and cross a killer’s path. I always find the process of writing fascinating—imagining words and thoughts into subsistence that had once only existed in my head. Oftentimes, the undertaking is daunting. Months of research, careful plotting, planning, character development, and revising go into every page. There are many moments of doubt and worry. On occasion, there’s even a triumph or two. But finally, you type The End and you realize you’ve created a miracle of sorts—a story to share with your eager readers who are always waiting for what’s next. I had such fun telling Nate and Callie’s adventure. There was something extra enjoyable about bringing Sanderson, Massachusetts to life—the fictitious, tiny town on the equally made-up Carter Island. Imagine dreaming up a beachy setting that gets to be exactly what you want it to be. Add a group of intriguing (and on occasion quirky) characters. Throw plenty of steamy romance and several sprinkles of mystery and suspense into the mix and you’ve got yourself one heck of a good time. 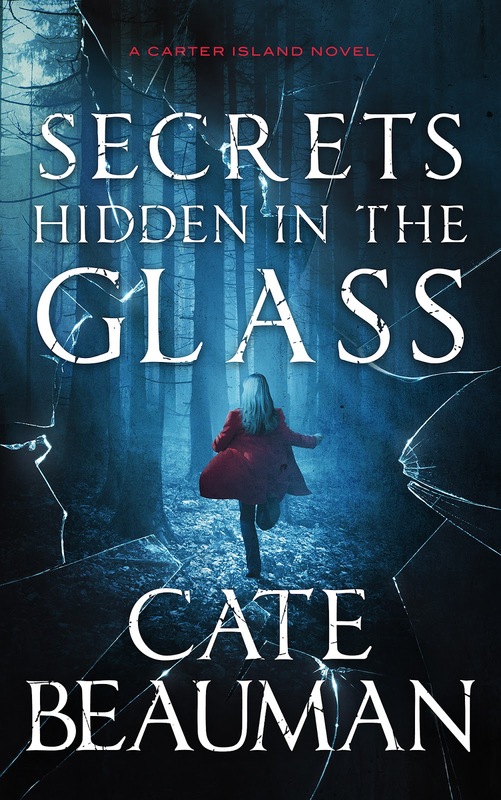 I hope you’ll enjoy Secrets Hidden In The Glass as much as I enjoyed telling it. Callie stood next to the grease-smudged door, sucking her thumb and clutching Emily Dolly close in the crook of her arm. Tinny music played through cheap speakers as she stared at the big man sitting in a booth across the room, snoring with his chin touching his chest while the food on his plate went cold. Glancing around at empty tables and chairs, Callie recognized that she was in a restaurant. Mommy took her out to eat sometimes, but she’d never been to this place before. She flinched and her gaze flew to a set of metallic doors when a woman with bold red hair pushed them open and walked from the kitchen. Callie gripped Emily Dolly tighter and stepped back, bumping into the cool glass. Callie tried to move farther away but there was nowhere left to go. Callie stared into the woman’s green eyes while her stomach twisted and turned and felt yucky. “Is that your little girl?” The waitress pointed in Callie’s direction. International bestselling author Cate Beauman is known for her full-length, action-packed romantic suspense series, The Bodyguards of L.A. County. Her novels have been nominated for the National Excellence in Romance Fiction Award, National Indie Excellence Award, Golden Quill Award, Writers Touch Award, Aspen Gold Award, Heart of Excellence Award, and have been named Readers Favorite Five Star books. In 2017 FINDING LYLA was chosen as the Booksellers Best Award Winner, the Maggie Award For Excellence, and received the Holt Medallion Award. REAGAN'S REDEMPTION and ANSWERS FOR JULIE were selected as rare co-winners of the Aspen Gold Award in 2016. JUSTICE FOR ABBY received the 2015 Readers' Favorite International Book Award Gold Medal, while SAVING SOPHIE took the Silver Medal. SAVING SOPHIE was also selected as the 2015 Readers Crown Award winner for Romantic Suspense and FALLING FOR SARAH received the silver medal for the 2014 Readers' Favorite Awards. Cate makes her home in North Carolina with her husband, two boys, and their St. Bernards, Bear and Jack. Thank you Maureen! I hope you are doing well!